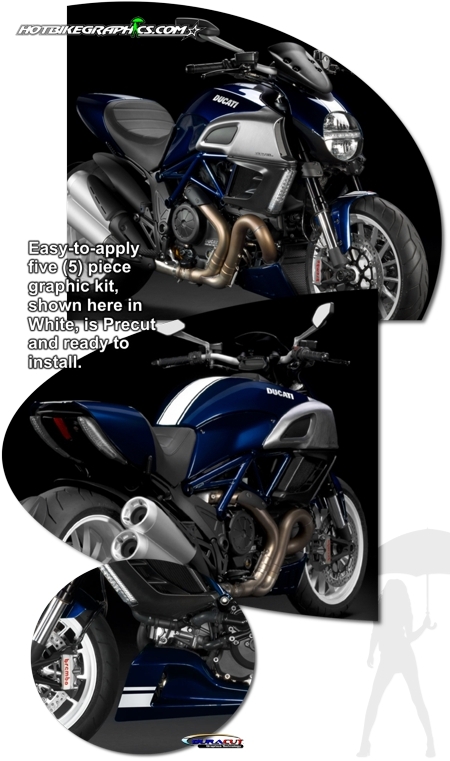 Want to set your Ducati Diavel apart from the rest of the pack? Dress it up with this tough looking Rally Stripe Graphics kit. Easy-to-install kit is packaged as a set of five (5) PRECUT pieces, ready to install, in a wide variety of colors - NO TRIMMING required. Stripe package is not just a set of 4.25" (10.80cm) strips in a box. Kit consists of prefitted, tapered and contoured pieces that feature a 0.25" (6.35mm) pinstripe at each side as shown. Rally Stripes are specifically fit for the '11-Current Ducati Diavel Fender, Windscreen, Tank & Pillion areas. It will not fit any other bike.